(FTR) posed a few questions to Jordan Battani, principal at CSC, and Allison Viola, MBA, RHIA, director of federal relations at AHIMA, to get a general idea of how the program shakes out now that its principles have been written in stone. FTR: How does the final rule differ from the original version? Battani: The final rule on the ACOs in the MSSP (Medicare Shared Savings Program) reflects careful consideration of comments received from the stakeholders during the proposed rule review period—and there are many changes. In summary, it’s clear that CMS worked to relax the requirements and to remove many that were likely to act as barriers to entry for provider organizations. The other factor that’s changed is that the commercial health plan and payer sector continue to expand their accountable care initiatives, which will only serve to increase the incentives for provider organizations to develop the necessary capabilities to practice and deliver accountable care. Viola: The quality measures have been reduced from 65 to 33. 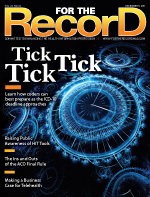 The requirement to have 50% of primary care physicians in the ACO be defined as meaningful users of electronic health records by the start of the second performance year has been removed. The CMS will be heavily weighted as a quality measure but not required for participation. The CMS will continue to monitor this information for future consideration as a requirement. FTR: Have the risks and rewards shifted? Battani: The biggest change is the fact that the final rule separates the risk-sharing models into two distinct flavors. The first, designed for smaller, newer, less sophisticated ACOs, is limited to sharing in savings that are achieved. In the shared-savings-only model, the ACO is not accountable for losses. The second version, which has a higher potential payback, includes sharing risk for losses. It’s designed for more mature ACOs. Other changes include the elimination of withholds, so the sharing is on the “first dollar” of savings achieved, and there’s a new program to provide for advance interim savings payments to smaller, more vulnerable ACOs. The advance savings payment program is designed to provide these smaller organizations earlier access to payments that could be used to fund the capital requirements of ACO formation, and it’s also designed to soften the impact of the fact that the first “year” of MSSP participation will now be anywhere from 18 to 21 months in length. FTR: Do the final regulations disappoint in any respect? Battani: The fact is that the remaining requirements are still a significant challenge for most organizations, and there’s a sense in the provider community that the investments required to meet the challenge are far larger than any incentive payments the program might eventually pay. Viola: We [AHIMA] were very pleased to see CMS pull back quite a bit on the quality measures and remove the requirement to have 50% of primary care physicians be defined as meaningful users of EHRs. We felt that this particular requirement was very risky and would be a deterrent to increased adoption, implementation, and use of EHRs, which would be counter to the goals of CMS and ONC (the Office of the National Coordinator for Health Information Technology). We were also pleased to learn that CMS continues to acknowledge and recognize the need to coordinate and align the quality reporting programs. We were disappointed to learn CMS did not provide guidance or direction for the need to have an HIM professional as part of the management structure. Ensuring the governance of data that will be exchanged among providers and maintaining data integrity is critical to patient safety and quality of care. We will continue to provide input and recommendations as this program continues to modify and improve. FTR: What effect will the changes have on an organization’s HIT strategy? Battani: The underlying capabilities that a successful ACO must demonstrate have not changed, and it’s those capabilities that are the drivers for HIT investments around accountable care. The good news is that HIT investments that are required for accountable care—like enterprise EHRs, health information exchange, and patient engagement tools—are also required for achieving mandated levels of meaningful use. Health delivery organizations will be able to leverage the same investments to achieve two sets of significant requirements. FTR: How will the changes affect HIM? Viola: The changes regarding the meaningful use requirements are certainly welcomed; however, by CMS considering this requirement sends a signal to the healthcare industry and its stakeholders that they are committed to increasing the adoption and implementation of EHRs. This activity must be closely monitored in future regulatory initiatives. The overall changes to HIM is the ncreased need for closely coordinating and enhancing data quality and integrity as information is shared and used among the providers within the ACOs. There will be the need to claim a seat at the ACO governance/management table to ensure quality is maintained or improved. This is also an opportunity for clinical documentation improvement (CDI) by the providers as other providers within an ACO will be relying on and making clinical decisions based upon disparate information gathered and aggregated for treatment. CDI is a function that HIM professionals are uniquely skilled and qualified to provide leadership and guidance to achieve accurate and complete patient information.